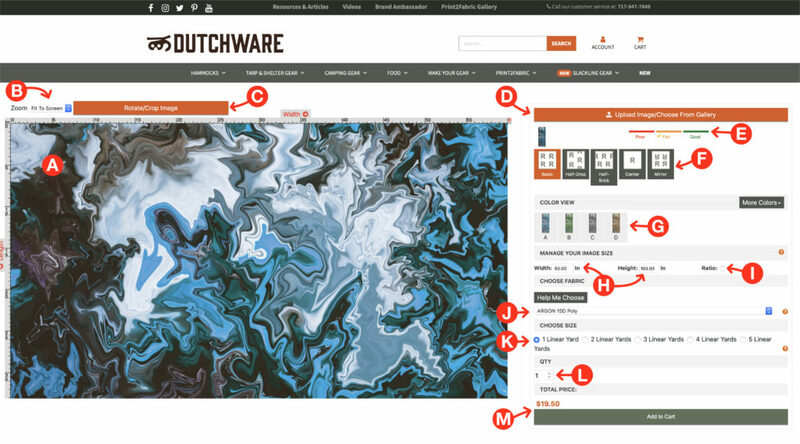 The design preview is where you can see all the detail of what your print will look like. Use the zoom to see what your design will look like when full scale. For example: 100% zoom will be representation of full size when printed. Fit to screen is best used for designing so you can see you whole pattern. This button opens up a new window (Figure 3 below) to allow rotating and cropping of your current image. Use this button to choose from our default image gallery, upload your own images, or choose from your previously uploaded images. See Figure 2 below for more details. The quality meter tells you if your image is high enough quality to be printed clearly. If your image is showing as poor or fair you can adjust your image size (See D below for details) and make your image smaller until the quality is Good. Choose how you would like your pattern to repeat or choose center to not have any repeat. Add some color layers to your image and easily change the color without having to edit your file. This is where you can change the size of the image you have uploaded. This only changes the size of your individual image, not the size of the complete pattern. Use this checkbox to link or unlink your image width and height. Choose the fabric you want to have your pattern printed on. If you are unsure which fabric to choose for your project, use the question mark to the right for more details on all of our fabrics. 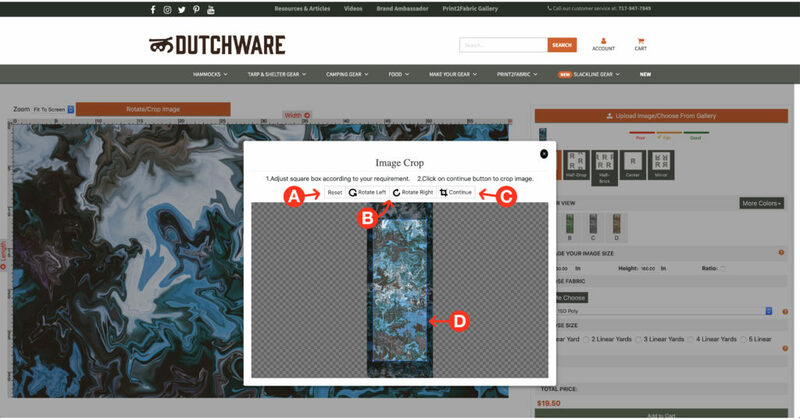 If you have an image that you would like to print with no repeat larger than 1 yard, use these options to extend the design preview window to see your full image. For example: if you want 5 yards printed of a mountain landscape then choose 5 Linear Yards and you’ll be able to see your full image. Then choose quantity 1 below and you’ll receive 5 linear yards of your mountain landscape. Choose the quantity to be ordered. This is the quantity of the size you have chosen above. See examples below. Example 1: I choose “1 Linear Yard” under choose size and my quantity is 10. I will receive 10 continuous linear yards of my print. Example 2: I choose “4 Linear Yards” under choose size and my quantity is 2. I will receive 8 continuous linear yards of my print. The total price shows the full price of your order for this specific print. 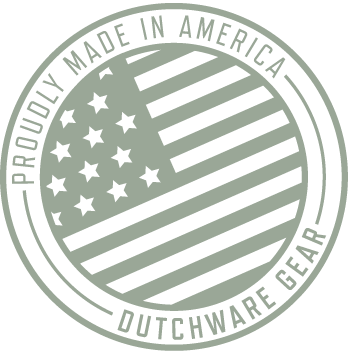 The price will adjust as you change your size and quantity. This is where you can see all your images you have uploaded. Upload your own image by clicking this button. Be sure you have the rights to use this image before uploading anything and you will need to click the checkbox (See D below) to verify that you have the rights. This where you can view our default images. We have a large selection of patterns and images to choose from. Please keep in mind, you will not be able to edit these patterns. When uploading images you need to make sure you have full rights to use the image. Check this box to confirm you have the right to use the image. 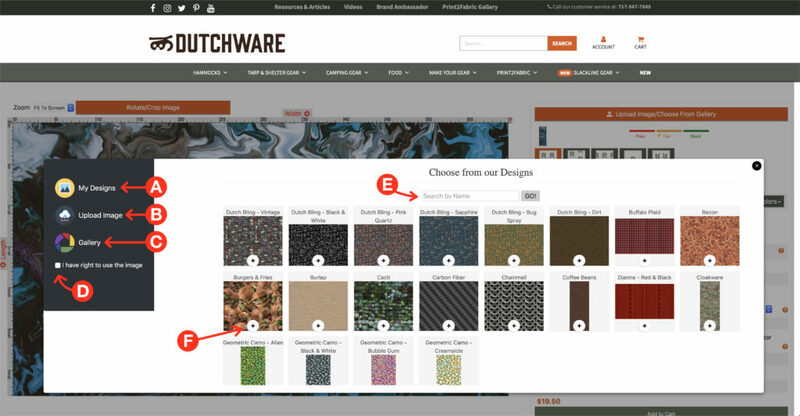 If you know the name of an image or pattern you’re looking for you can search for it here. The ‘+’ sign is used to select the image. Click this and you will see your image on the design preview. When you are making changes to your image in this screen you use the reset button to take you back to your original image. Once your image is to your liking, click continue to see what it looks like in your design preview. Use the blue box to crop your image as needed. If you need to zoom in or out you can use your mouse wheel to do so.